Dimensions: length/ 517 ft. width/ 64.6 ft. depth/ 22 ft. Engines constructed by William Cramp & Sons Ship Engine Building Co.
1888 15 Mar. Launched as City of New York, largest ship in commission in the world and first twin screw liner on the North Atlantic. 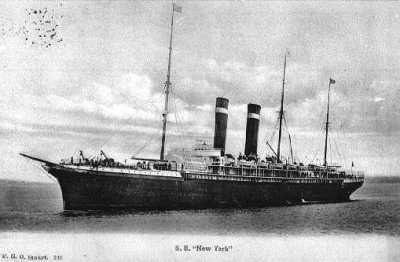 1920 Three masts reduced to two resumed name New York on the westbound route Southampton-Cherbourg-N.Y, eastbound Southampton-Plymouth-N.Y.